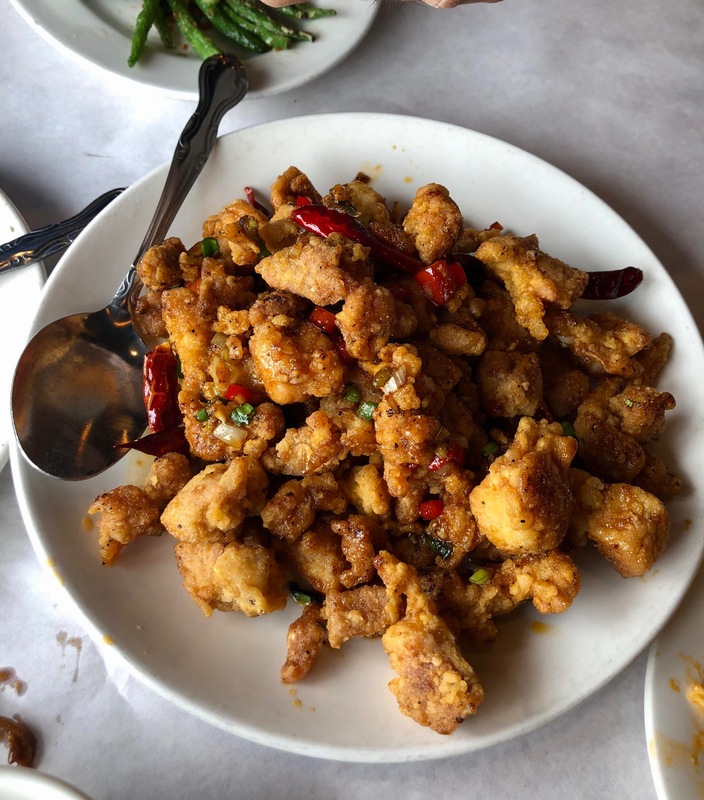 Yesterday’s Visitor’s Lunch was at one of my favorite Chinese restaurants in Chicago: Lao Sze Chuan, which of course features the food of Szechuan. We ordered way too much food, but it became leftovers. 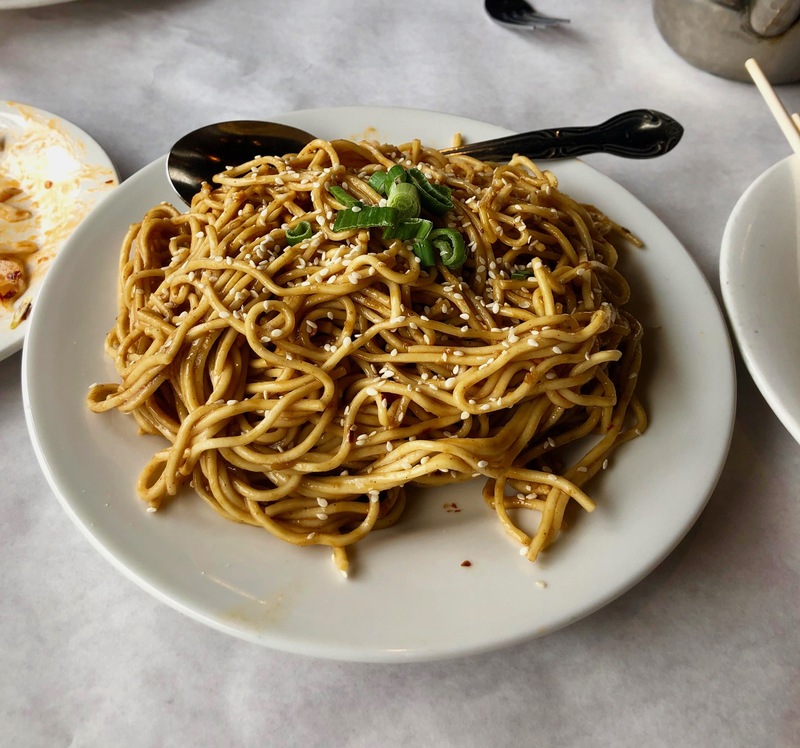 The restaurant became wildly popular when it opened as it was the first place to feature authentic Szechuanese food in the city. 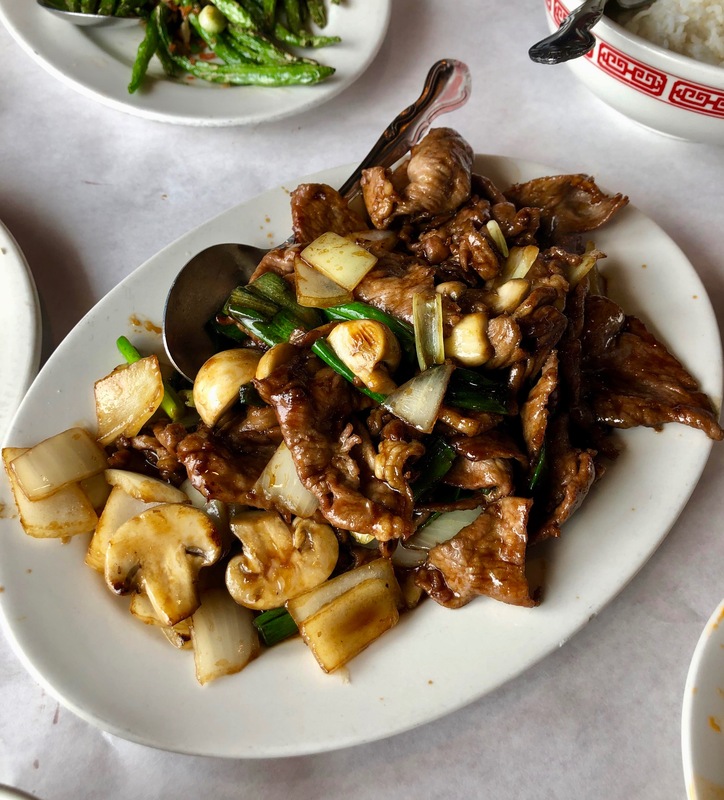 Now there are several branches in Chicago, as well as other states, but the original downscale spot in Chinatown is still supposed to be the best. That is where we went, and the food is as good as ever. Appetizers: Chengdu dumplings and cold Szechuan noodles with sesame sauce. This entry was written by whyevolutionistrue and posted on March 1, 2019 at 1:00 pm and filed under food, food and drink. Bookmark the permalink. Follow any comments here with the RSS feed for this post. Post a comment or leave a trackback: Trackback URL. Suddenly I am very hungry. I lived in Hyde Park for a few years while my wife was at U of C law school, and we used to go to a Chinese place near campus–I cannot recall the name of the restaurant–where they had a dish called “Empress Chicken.” I’ve never had it anywhere else before or since, but it was wonderful. Does PCC(E) or anyone else know of the restaurant or the dish (and if anyone anywhere else makes it)? They also had really good egg rolls. That kind of stuff is some of my favorite food. I eat at a restaurant named Szechuan at least once a week. I work with many first-generation immigrant Chinese colleagues. Most of them tell me that this is their favorite local restaurant. We have quite a good Szechuan take-out joint nearby. My son worked there during high school and would bring great stuff home (with an employee discount) after his afternoon shift. I kind of try to forget that it’s there because some of the food is like the “crack” above. (Crispy spicy shrimp, pan-fried dumplings, Calgary beef (no idea how it got thst name, but it’s done kind of like your crack chicken)). Alberta beef would be more correct, but point made. Why Alberta rwther thsn Calgary? Those Chengdu dumplings look wonderful. I prefer mine pan fried and then steamed, but will take them any way I can! Costco actually sells frozen Gyosa Japanese dumplings which are quite similar. Pan-fried in about 10 minutes. 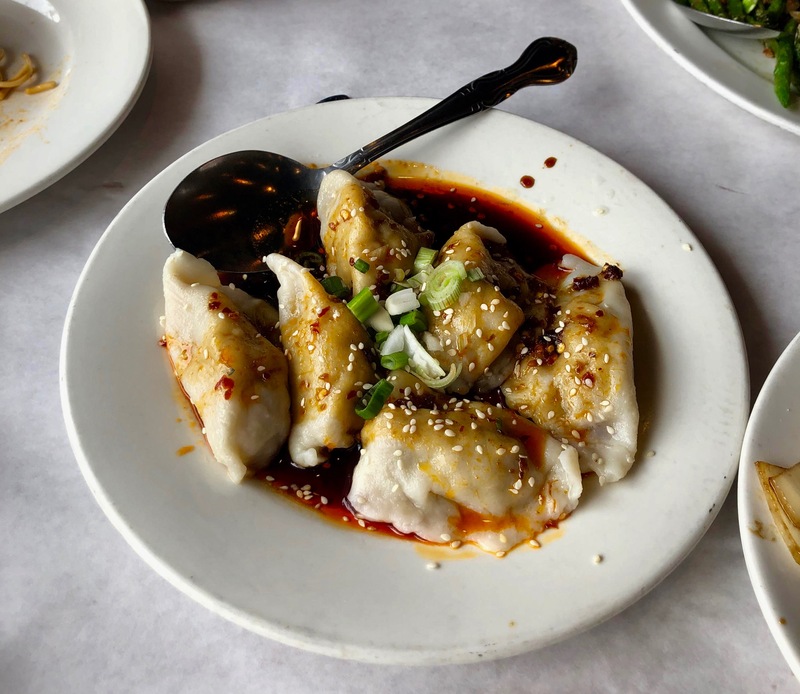 I took a Szechuan cooking class eons ago and learned to make the dumplings from scratch, but it’s very time- and ingredient-intensive (something called “pickled vegetable” which I still had in the fridge for about 10 years). Easy enough to buy good ones. The Costco ones of course come packaged in the gazillions ( well, maybe 2 packs of say 25 each), but you can always just fry up a few at a time. I love Szechuan food though reading the menu is tough sometimes for those of us squeamish about eating all the animal’s parts. You made some good choices here. Now I must go on the hunt for Chinese food, which will fall short of the ones pictured here. Szechuan Garden, in College just west if Spadina, used to really good many moons ago. Yes, been a while since I ate there. I’d been going there since the early 90’s and haven’t found anything to replace it. Only pale second-choice alternatives that only remind me how great that restaurant was. It seems to have moved around the corner and down Spadina,@and now spelled Sichuan. The other one was actually written Szechuan GaLden in the phone book. There used to be a great Chinese seafood joint on the north east corner of Spadina and Baldwin, called something like Xian Yuit. Maps only shows a Sang’s seafood, which may be the same thing. Excellent stir-fried lobster sith black beans and garlic. Much obliged for the info merilee. I’ll check it out. I wouldn’t be surprised if Toronto has several Chinatowns by now. Vancouver does, with the “traditional” one being not worth it anymore from what I understand. Heck, even Montreal does sort of (traditional part of Brossard and part of Cartierville/St. Laurent). Markhan (just north of Toronto) has a HUGE Chinatown. Is Szechuan food usually spicy? Vietnamese is my thing…. Usually spicier than, say, Cantonese, but the heat varies. I can’t take super spicy without getting embarassing hiccups. My parents used to take us to a restaurant in Chicago’s Chinatown years ago, it was always a fun treat. I think the Restaurant was called Great China, and it was on the 2nd floor of the building. Is Hot and Sour soup a Szechuan soup? I love it, and it’s the only Chinese soup I can think of that is actually spicy. I also love any dish with Szechuan peppercorns and I enjoy the mouth numbing sensation it offers. I recently bought a “La Yu” (chili oil) made with Szechuan peppercorns- an amazing ingredient. Yup, I learned how ro make that soup in my Szechuan cooking class. It’s great with the szechuan peppercorns, which I recently restocked from amazon. Might have to look for the oil. Gochugarum (sp?) is really good Korean chile powder/paste. The Korean guy at my local Korean store got a chuckle out of my pronunciation of gochu….I even put said chili powder and/or paste in non-Korean dishes. It’s fairly easy to control the heat. Best Hot & Sour I ever had was at Mei Ling in Metuchen NJ. We ate there regularly but one night ~1979 when we craved Chinese happened to coincide with a blizzard. We called and they were open. Threw a set of chains on the trusty Falcon wagon and off we went. The place was empty, but the H$S was way better than we’d ever had there before. We figured thay made it for themselves, figuring that nobody would show up. 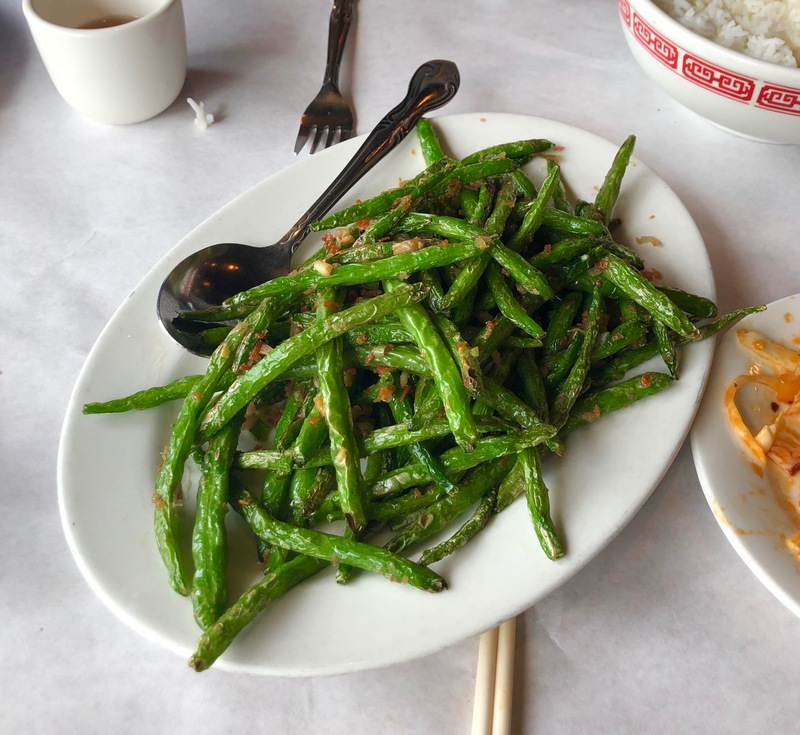 And Szechuan green bean was a staple there for us. Once they were out of green beans so we asked if they could make it with broccoli. They hesitated. We said just pretend the broccoli is green bean. It was great, of course. And a few wks later it appeared on the menu. Szechuan broccoli can be great! Yes, nothing is as satisfying as H&S soup on a cold winter’s day. Does Lao Sze Chuan still do the practice of having more dishes available if you bring a native speaker? That’s a common issue with Chinese restaurants which I discovered long ago. Good to bring along an Asian-y friend. Even better if they speak the same language as the restaurant help. It is getting better though. It has been a long time since a waiter has brought me a fork to replace my chopsticks without me asking for it. We have quite a few places with dual menus but they are mostly Thai and Sushi. I’m not sure where it got started but we’ve had Thai places with sushi bars inside for a couple of decades at least.